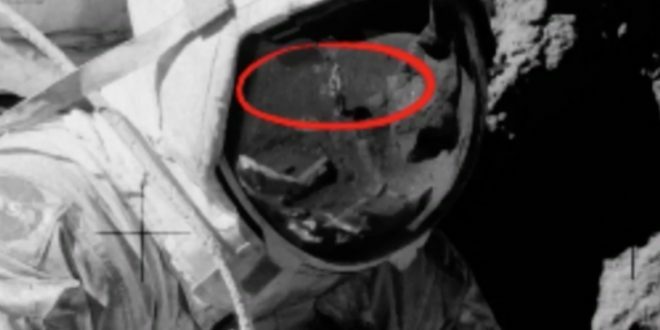 NASA could have been caught out “faking” the lunar landings amid claims a “stage hand” can be seen photographed in the reflection of an astronaut’s visor who was supposedly on the moon. A conspiracy theory video uploaded to YouTube suggests a human figure not wearing a space suit has been captured on camera during the 1972 Apollo 17 landing. As it zooms in on his visor, a figure seems to appear in the reflection – without wearing a spacesuit. “It is from a Moon photograph,” the YouTube user said. “It is a reflection from one of the astronaut’s face visor, so I thought it looked a bit strange. “I took a picture of it using my software. “What we appear to have here is a figure of a human not wearing a space suit, circa early 70s, it is an Apollo 17 photograph. The alien enthusiast admitted he had believed in the moon landing before he came across the pictures. But viewers had mixed reactions after watching the footage. “If not an astronaut then another being in a spacesuit,” one user commented. No, sorry, the shadows don’t match up.